As the driver, you should have sleeves to cover up your shoulders and back, preferably long sleeves despite the heat as you will need them to block your skin from the hot sun. The number one place that the sun will be beating down on is your legs – so lotion up! As the passenger, if you aren’t wise to follow the local custom of wearing long sleeves then here are the places you must put sunscreen on. Imagine you are holding onto the person in front of you and put the sunscreen on the bend of your arm and the outer forearms and upper arm. 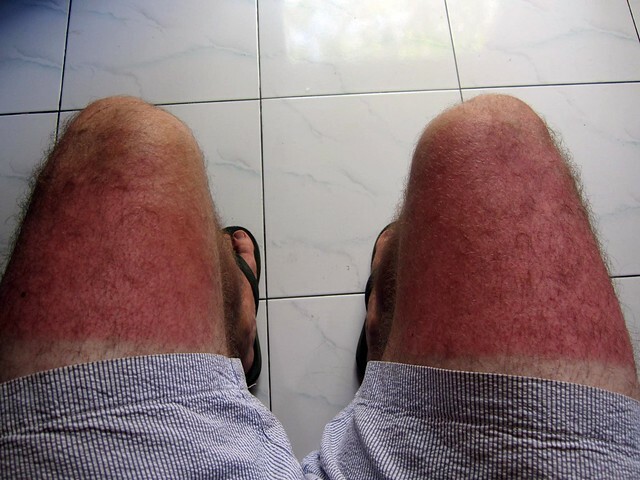 Your legs will most likely be wrapped around the person in front of you so your inner thighs wont get much sun, but make sure to put it on the outer area of your thighs. That oughtta hurt… Don’t forget u guys are in tropical land now. I almost never forget the sunblock lotion. As I keep losing hair (going bald, yeah) it’s a must care situation.